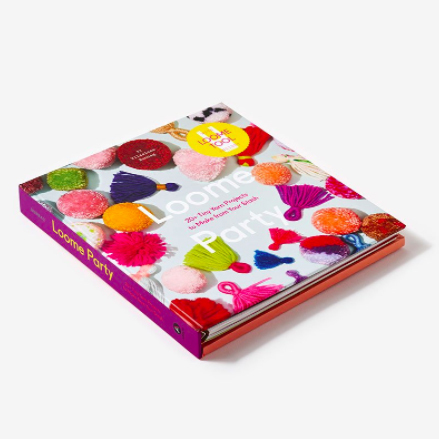 It’s giveaway time as we are so excited to share the hottest book on the craft market - Loome Party! This bright, colorful and playful book will teach you how to use the Loome tool to make splendid projects using only your yarn stash! Learn the foundations of creating pom poms, tassels, friendship bracelets, weavings, and make more than 20 projects—each developed by a guest designer—including pom-pom gift toppers, woven bracelets, and tassel garlands. Loome Party is a fun and full of approachable how-to projects for readers of all ages. To participate, follow us and The Loome on Instagram and tag 2 (or more!) friends to this Instagram post. Feel free to also share the project you are dying to make, we’d love to know. Okay, good luck everybody. The winner will be announced on May 2nd!